WheresMyBackpack’s weekly photo theme (statues) is the perfect segue into our Spring Break vacation this year. We’ve returned to Tybee Island, Georgia for the second time. 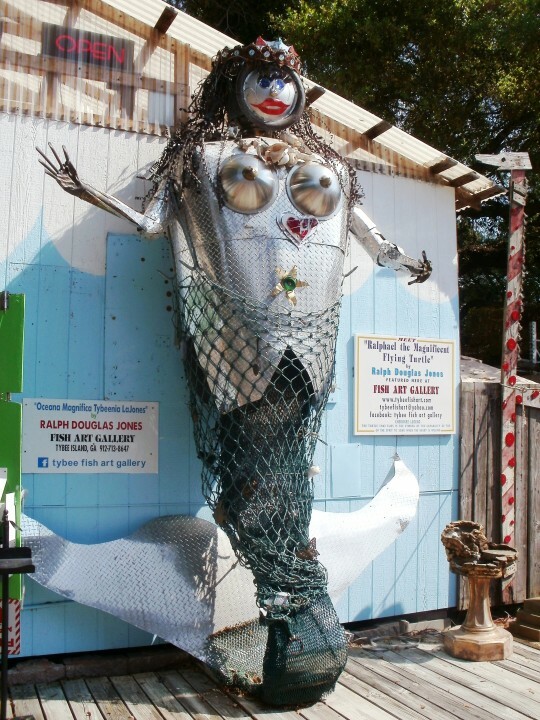 As you arrive in town, you spy a gigantic silver mermaid sculpture with her hand raised in greeting. This is Tybee Island: a family-friendly seaside retreat, dotted with beach cottages, an island lighthouse, and small-town charm. As soon as we saw her, we were on vacation. she may give me nightmares! I was thinking the same thing. This counts as family friendly? What kind of family? I used to have nightmares about C3PO so maybe I’m not the best judge. I just love these little touches of kitsch while on the road. The old Route 66 is still full of them. I do, too. I haven’t done Route 66 before, but will look forward to it. Got to admit, that’s a little creepy. Not during the light of day but maybe walking by at night and you see it from the corner of your eye. Yikes! What a cool statue. I find her mainly friendly, but yeah, a little creepy too. I think it’s the vacant look in her eyes. She’s like a character from a Tim Burton film to me.